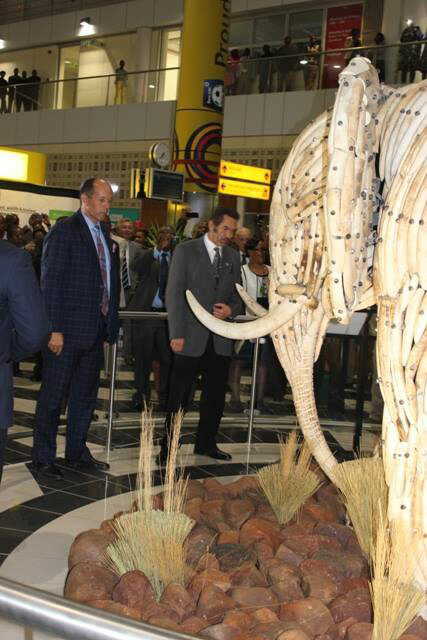 Below is the speech given by Botswana’s President Khama on the occasion of the unveiling of the elephant ivory sculpture at Sir Seretse Khama International Airport in Gaborone on 16 July 2015. 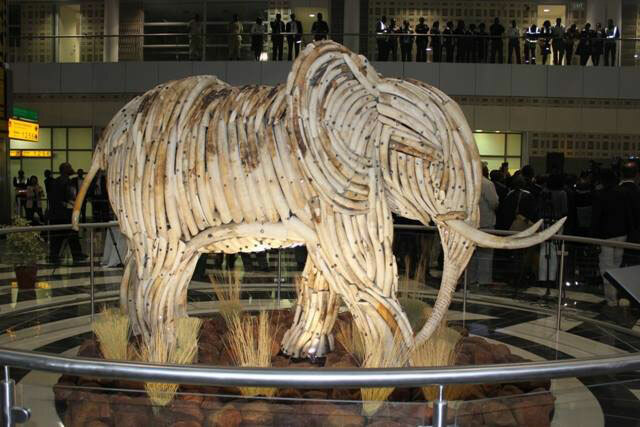 The sculpture, which is a demonstration by the people and the government of Botswana to protect the elephant against illegal killing and illegal trade in ivory, was constructed using ivory tusks that were recovered from elephants that died a natural death. “It is indeed a pleasure for me to be here with you this afternoon at this momentous occasion of the unveiling of this elephant ivory sculpture. 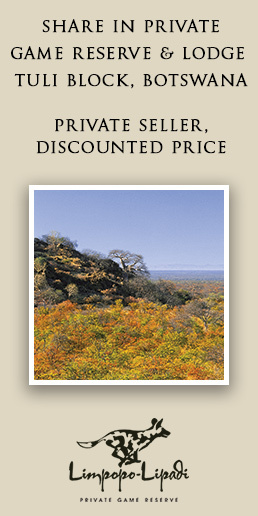 This work of art is intended to raise our collective consciousness about the plight facing the African elephant today. 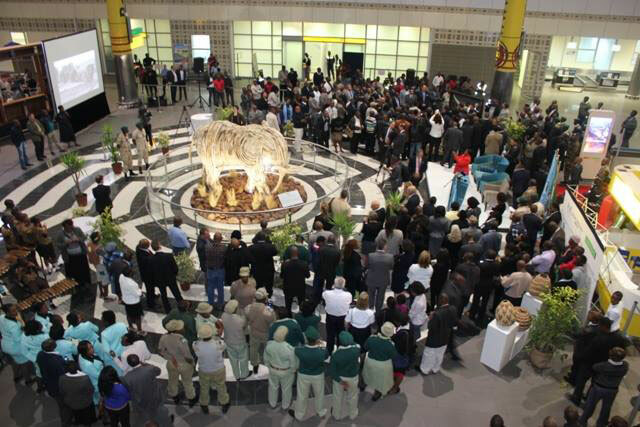 The placement of the sculpture here at Sir Seretse Khama International Airport is highly symbolic as it represents the international dimension or magnitude of the illegal ivory trade. Most of the ivory that leaves the borders of African elephant range states finds its way out in the cargo holds of aircraft and the luggage of passengers. Customs officials and airline staff now find themselves in the frontline pertaining to the battle to combat ivory trafficking. It is, therefore, imperative that they are adequately trained and resourced so as to act as the eyes and ears on the ground. In this regard, I note with great appreciation the efforts underway by the international Transportation Taskforce established by the Royal Foundation, under the patronage of His Royal Highness the Duke of Cambridge, to address how the transportation sector can assist in combating illegal trade in wildlife. It is estimated that currently, there are about 600,000 elephants left on the continent and Botswana is home to approximately one third of this total. This magnificent animal is the target of unscrupulous individuals who seek to systematically strip away our natural heritage in the selfish pursuit driven by greed. Figures shared with international delegates by the Convention on International Trade in Endangered Species – Monitoring of Illegal Killing of Elephants (CITES-MIKE) at the recent African Elephant Conference held in Kasane revealed that between 2010 and 2012, up to 100,000 elephants were slaughtered for their ivory. If this trend continues unabated, it is likely that elephants will go extinct in most of their range in our lifetimes. In recent times, large scale ivory seizures are being made along the illegal ivory chain. It is, however, encouraging that many more of these seizures are now being made on African soil, suggesting that law enforcement efforts are being stepped up in response to this crisis confronting the African elephant. In 2014, the Government of Botswana, along with four other African elephant range states; namely, Chad, Ethiopia, Gabon and Tanzania launched the African Elephant Protection Initiative (EPI). The EPI proposes a number of actions, including the removal of elephant ivory from economic use until the African elephant’s survival is no longer threatened by the illegal trade, underlining the need for closure of domestic ivory markets in this respect. Legal ivory trade cannot and must not be used to launder illegal ivory in the hands of the criminal syndicates. I call upon all range states to subscribe to the principles espoused by the EPI. The dynamics of the illegal ivory trade have demonstrated that it is not enough for range states to combat poaching and ivory trafficking within their borders. It is incumbent upon destination countries to address the demand that continues to drive the illegal trade. The Kasane Statement calls for the strengthening of partnerships among source, transit and destination countries to combat illegal wildlife trade along the illegal ivory chain. In addition, we must target those who profit from this heinous trade and hit them in the pocket by enacting and rigorously enforcing legislation to enable the confiscation of proceeds of crime derived from illegal ivory trade offences. Let me also to take this opportunity to commend the artists whose ingenuity you see before you today, as well as everyone else involved in this project. This unique sculpture will serve as a reminder to all who pass through this building that conservation of this iconic species is our collective responsibility. A reminder that one live elephant is worth so much more than all the pieces of art made from ivory gathering dust in homes far removed from the African plains. This is our heritage, we have to safeguard it and ensure that future generations are also able to benefit from it.